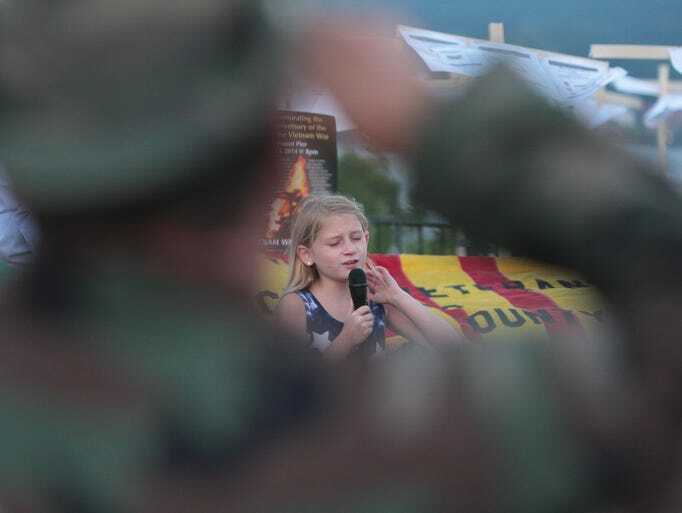 The schools are drilling the kids hard with the Common Core(aka Common Crud). One of the many things that are drilled into the 2nd graders this year is restating the question in their answer. They do drills on this often. My daughter saved this one to show me. I was so proud when I read her answers. 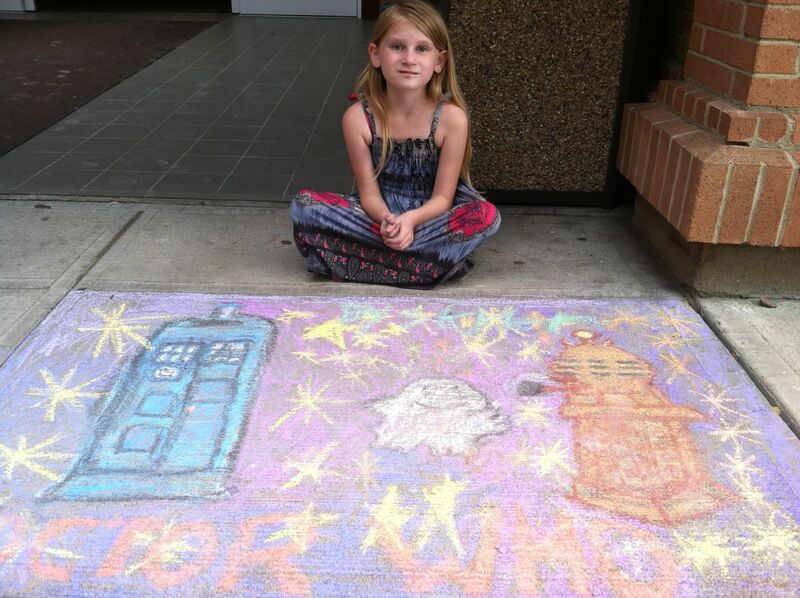 I love my little Whovian. 3. If you could travel to space, who would you take with you and what would you find there? 4. What did you dress up as for Halloween? Describe your costume. I dressed up for Halloween as Sailor Moon and Sailor Moon has long, long hair and a blue, small skirt. 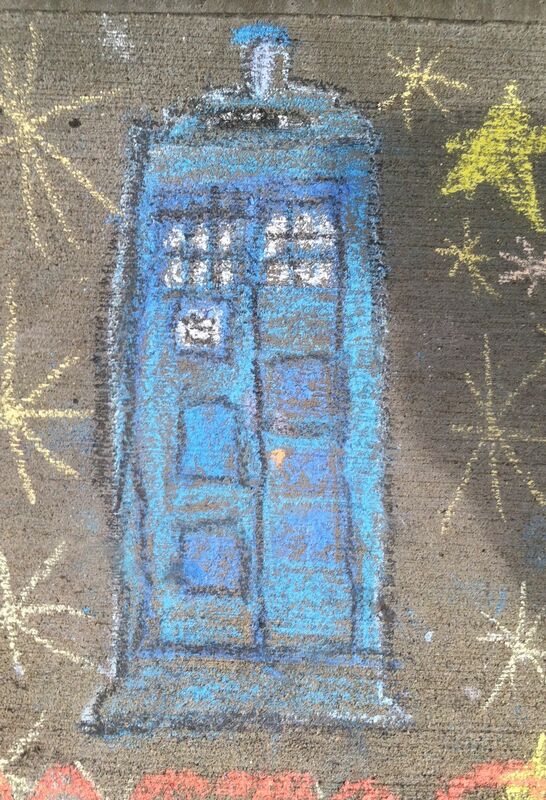 So tonight we had our local library’s summer reading annual chalk kick-off. 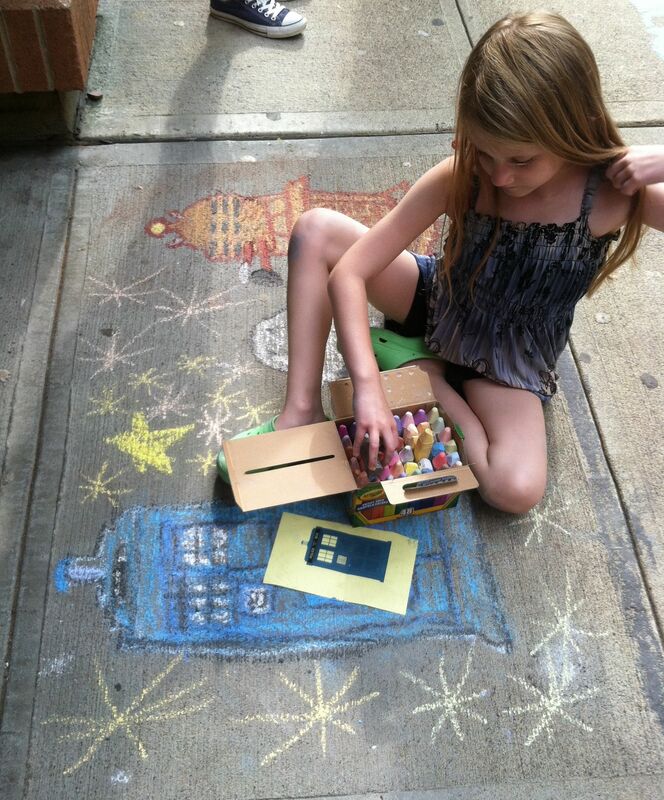 This event invites the kids to come and decorate a rectangle or square of concrete in front of the library with chalk. 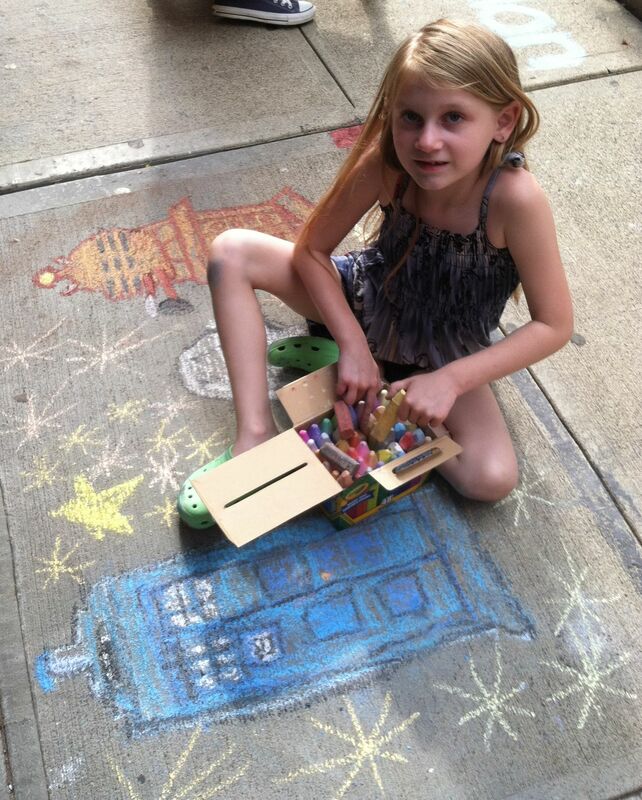 My picky 7-year-old artist wanted these new Crayola sidewalk chalk set that boasts to have crayon like colors. Wow, did they ever! 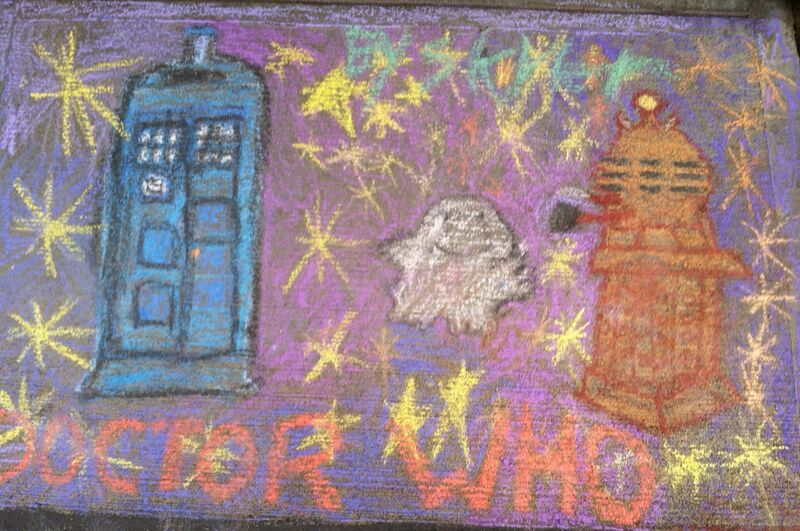 My little Whovian had a blast and created, what the local new website called: a Doctor Who poster. 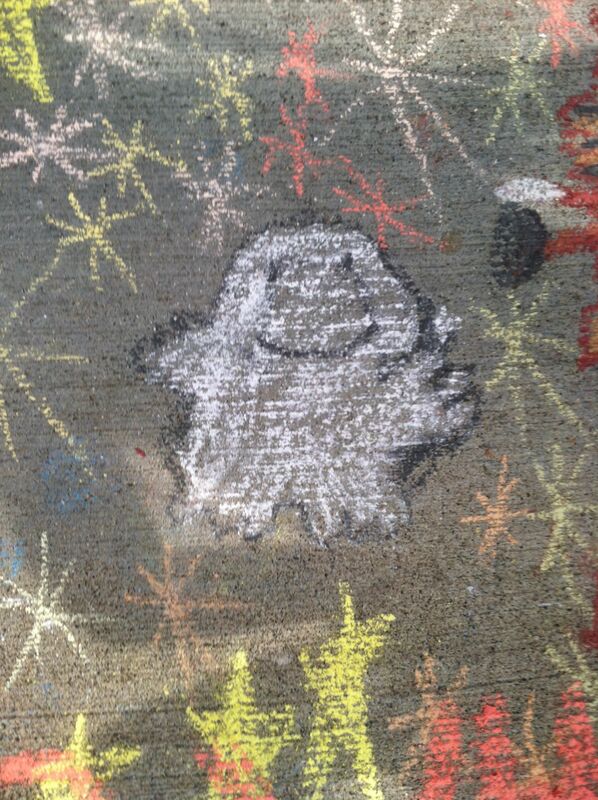 The chalk was truly amazing. The colors were vivid and with 48 of them, she had plenty to work with to create her masterpiece. She just really wished there was more black to do the outlines. 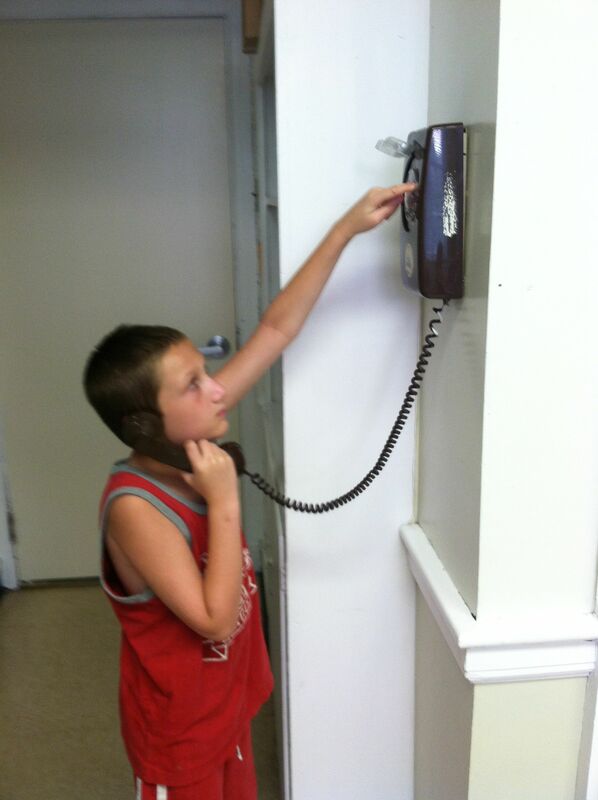 My 10 year old is finishing 4th grade and moving up to the junior high next year. For their graduation ceremony the kids were sent home with a long strip of paper with instructions to trace themselves and decorate their outline any way they want as long as they did not use REAL clothes. Being a HUGE Doctor Who fan my son decided he was The Doctor running into his TARDIS with his sonic screwdriver in hand to get away from a swarm of Dalek. It came out fantastic. He even glued on different shades of brown thread to make the hair on his head. Sounds pretty innocent, right? He was reprimanded by his school principal for having an outline with a weapon on it. A screwdriver can be used as a weapon and it looks like he is breaking into that blue telephone booth with the screwdriver. Wah? Huh? She went further to say that he should have made his face on his outline instead of him running into the TARDIS, back to the observer. She tried to make him draw a face on the back of his head but he refused. She offered him buttons to make the back of his suit look like the front. Umm? No where in the instructions was there anything that said make sure your face is in the picture. The instructions were pretty clear that you can do whatever you want as long as you didn’t use real clothes. My outline is of me playing The Doctor on Doctor Who. I am running to my TARDIS which is stuck looking like a London police call box from the 1960s. The TARDIS is short for Time and Relative Dimension in Space. It is a time machine and a spaceship. 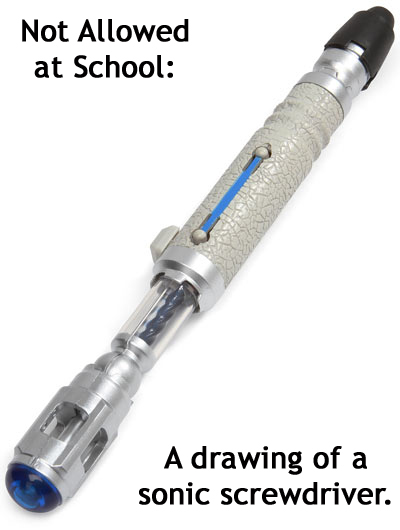 I am holding my Sonic Screwdriver. I can use it to repair alien technology, do medical scans, track alien life forms and occasionally open the TARDIS door when I forget my key. The Doctor often uses his sonic screwdriver to save the universe. I am running into my TARDIS with my sonic screwdriver to get away from a swarm of Dalek. I will use my sonic screwdriver to repair the controls of my TARDIS and save the planet from the bad guys by disabling their weapons. I do not like weapons. 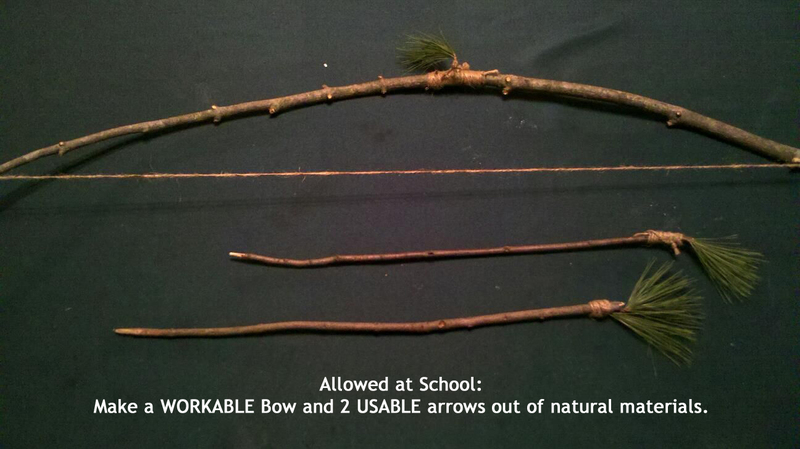 The thing that makes me most exasperated with this is that back in December he had a class assignment that required him to make a WORKABLE bow and 2 USABLE arrows out of materials found in nature. So having 9 and 10 year old children make WORKABLE/USABLE weaponry is allowed but drawing a Science Fiction-based tool is not. This same school district suspended several seniors for 5 days on the charge of “assault with a deadly weapon” and one of them was not even at school at the time but suspended all the same. What weapon did these seniors dare bring into the halls of the high school? Water Balloons. 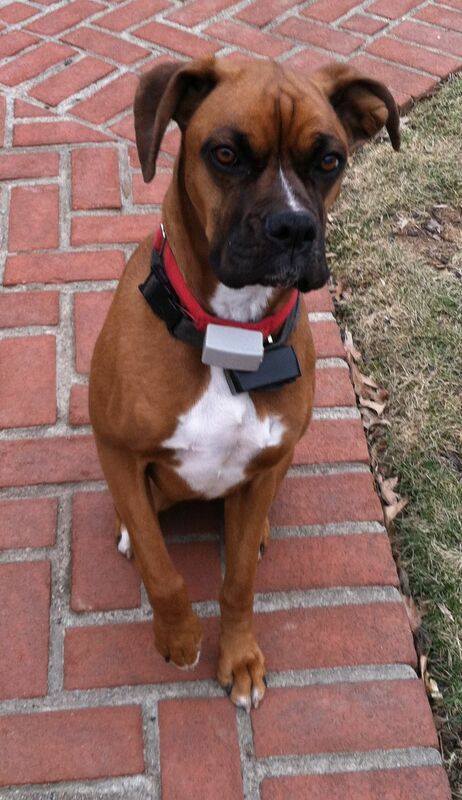 This was the odd sight at our house this morning. 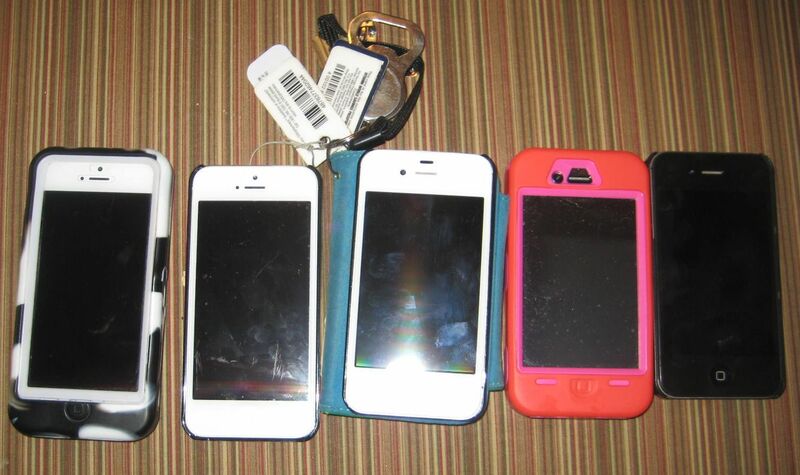 5 little iPhones sitting in a row. And five little iPhones showed their words. My kids love Nyan cat. 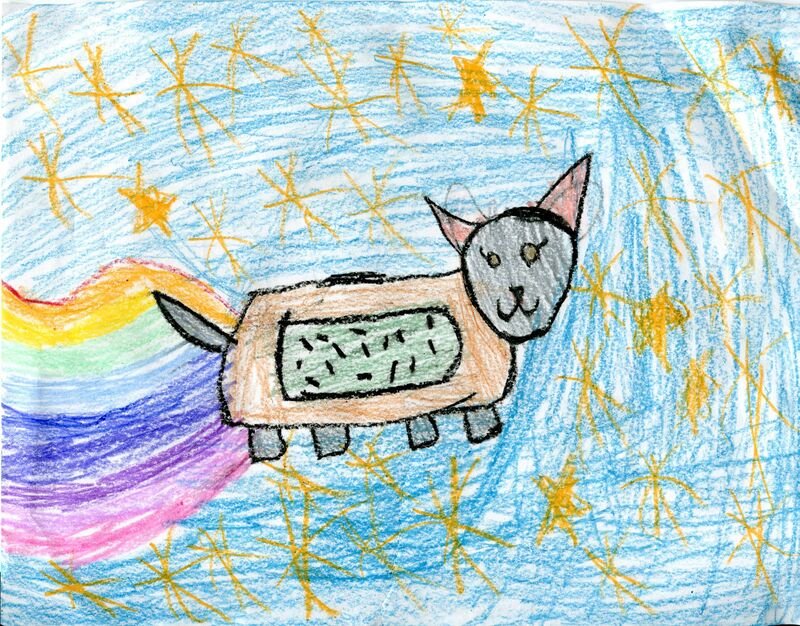 Skyler came home from first grade the other day having drawn her representation of Nyan Cat. 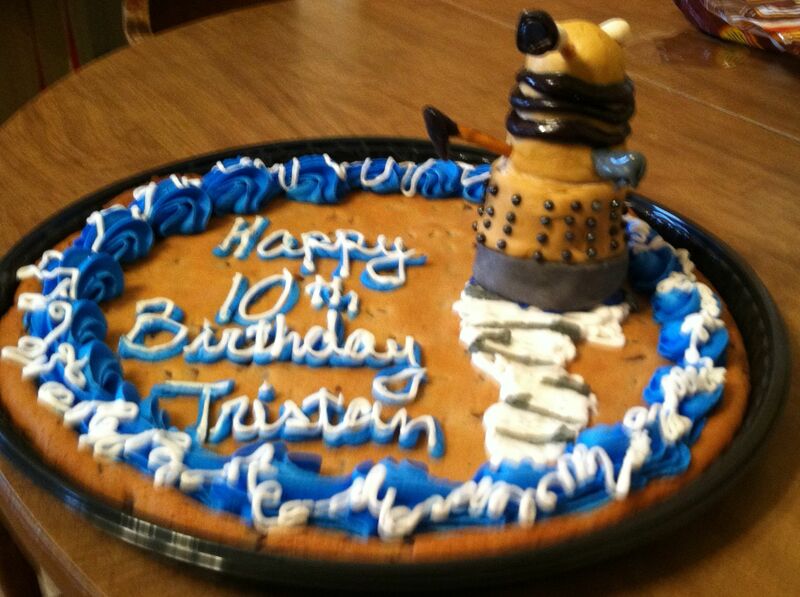 My son’s gift reflected what any new 10 year old would want when they are a Doctor Who fan. He received a Doctor Who Build Your Own Sonic Screwdriver Kit, Doctor Who Plash Talking Blue Dalek, Doctor Who: Character Encyclopedia , and Doctor Who Character Building Monsters Multi-Pack. With a few giftcard for now, he will be on the road to more Doctor Who. The cake toppers were a huge hit both at school with the store bought cookie cake and at home for the family cake. 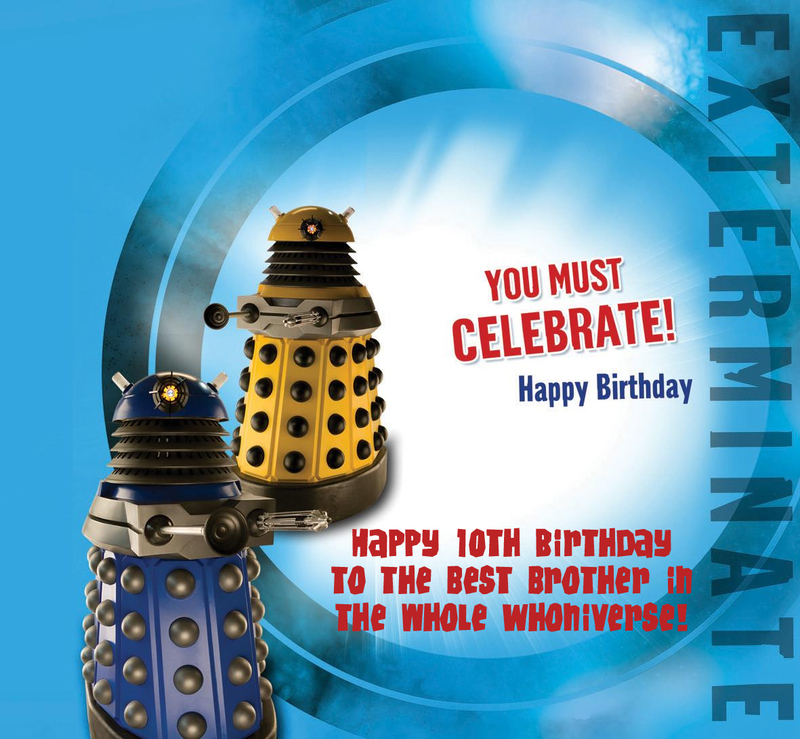 I also used photoshop to make custom birthday cards from myself and my daughter. Along with a telescope(I got for a steal right after Christmas for $1.99), a 6-in-1 robot kit(Five Below), an Excalibur Remote Controlled ORB(I got on clearance for $12), and the gifts from the family, I would say he had a great birthday. Tristan as the 10th Doctor. In 1963, William Hartnell began a tradition that would last 50 years when he starred as the Doctor in the very first episode of Doctor Who. Hartnell’s illness would lead the writers to find a creative way to let Hartnell’s Doctor leave the show but not the Doctor himself. Thus, regeneration, or renewal as it was called back then, was born and Patrick Troughton became the second Doctor. One simple fix for a sick actor lead to the ability for Doctor Who to live on to see its 50th Anniversary this year. One bit of exciting news for this anniversary is that five of the past Doctors and a few of their companions will be returning for an audio adventure entitled The Light at the End. Tom Baker(4th), Peter Davison(5th), Colin Baker(6th), Sylvester McCoy(7th) and Paul McGann(8th) have all been confirmed to voice their version of the Doctor. The companions who have been confirmed to voice their characters so far are Louise Jameson(Leela), Sarah Sutton(Nyssa), Nicola Bryant(Peri), Sophie Aldred(Ace), and India Fisher(Charley Pollard). In addition, Geoffrey Beevers, the Master from 1981, will voice the Master in this episode. The geek in me has to share this list I put together for my son of the Doctors. I wanted to show him why most of the anniversary specials would either be novels or audio if they were to include the Doctors prior to the 9th. 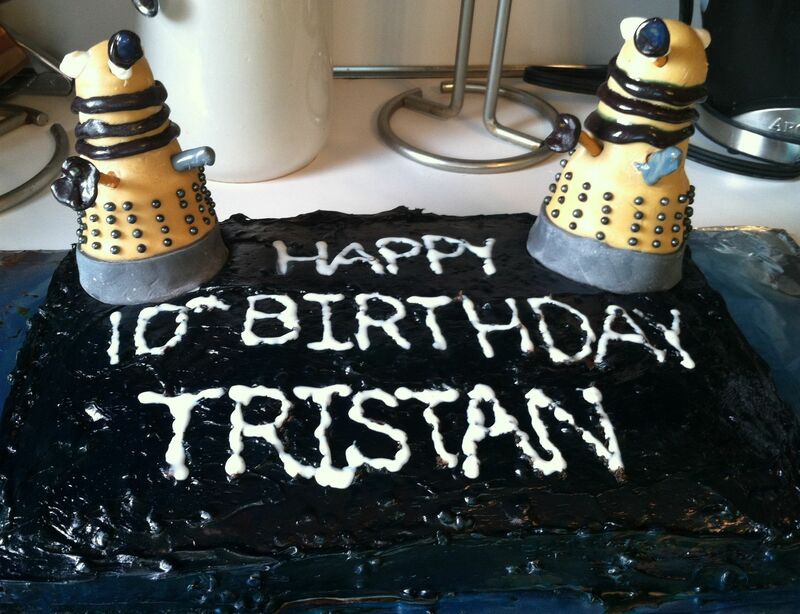 Tristan also received a few Doctor Who gifts for Christmas. 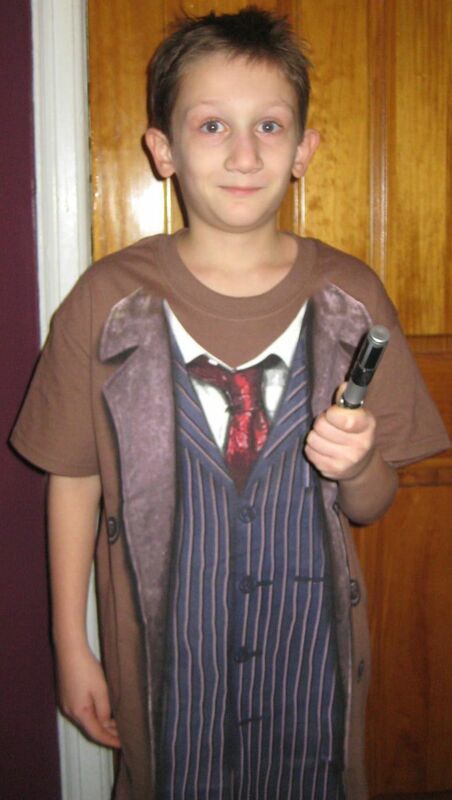 I got him the shirt he is wearing in the picture called 10th Doctor Costume Tee from ThinkGeek. His aunt visited from England and gave him Doctor Who Mini Figure Set of 11 Doctors and the Doctor Who Time Lord Psychic Container. He has a wish list a mile wide from the products at ThinkGeek. I love the DVR! I have been able to record and watch many of the classic and many of the new children’s Christmas specials this year with the kids. If you want to find out when your favorites are on, check out the schedule at Christmas Special Wiki. I have listed the ones we have watched or are set to watch below by the year they were released. They are great for getting them motivated to get up and ready for school on time. Once they are all set, we watch one of the specials because most run about 21 minutes if you fast forward the commercials. One of their all time favorites is Olive, the Other Reindeer.